When APP first began its work, more than 10 years ago, our aim was to transform prison conditions. We could see the impact on so many still awaiting trial, of an overcrowded and intimidating environment and we wanted to begin by making lives easier in any way we could. So we began with health and life-skills training. However our vision has always been for more than just improving lives. We wanted to turn the very idea of prison on its head, and empower those in prison - prisoners and prisoner staff - to become changemakers themselves. In those ten years we’ve seen prisoners become lawyers, and prison staff trained to provide legal representation. This has enabled those who are wrongly imprisoned to walk free. We’ve also seen sentences overturned or reduced, with individuals returning to their communities with new purpose and passion. APP exists to transform imprisonment across Africa - from the inside out. And in doing so, to see the prisons emptied of those who should no longer be there. In a bid to reduce the cost of imprisoning so many, Kenyan President Uhuru Kenyatta has asked the Ministry of Interior to decongest all prisons, with a target to release 10,000 inmates. 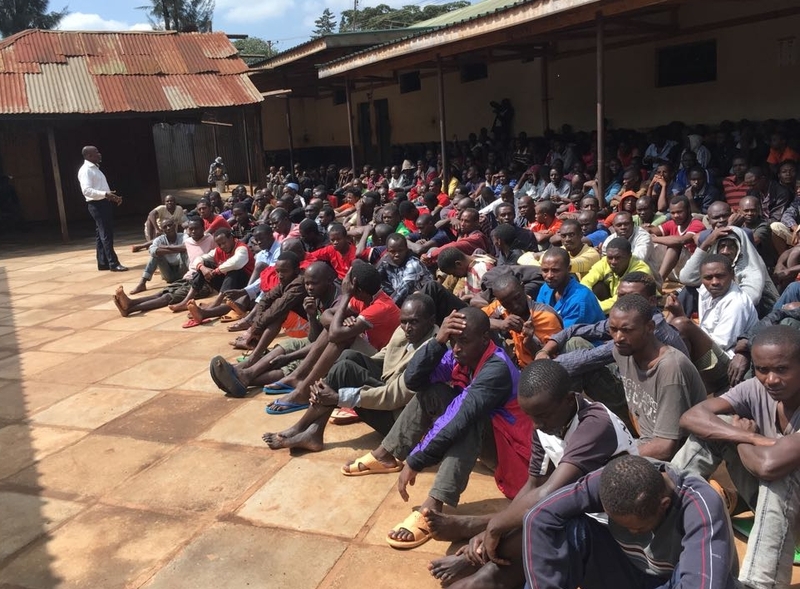 Thika Prisons’ Chief Warder Mathews Kimanzi acknowledged that most of the people filling Thika Prisons are remandees - those awaiting trial - adding that the government needs alternative measures to reduce prison numbers. Access to justice is hard to come by. Most prisoners cannot afford legal representation and many are unaware of their rights or responsibilities. This causes costly delays for the Courts and lengthy prison terms for those still awaiting sentencing. One of the simplest but most effective ways that APP works to bring transformation is by raising awareness amongst prisoners across Kenya and Uganda. APP recently held a legal awareness session in Thika Remand Prison. Those still awaiting a plea hearing were advised on how to plea, avoiding long trial processes which force them to spend longer periods in custody than their maximum sentences. The remandees were also reminded to have their charge sheets and statements with them before their plea hearing. At Kiambu Remand Prison 396 remandees attended APP's latest legal awareness session. They discussed court etiquette and advised those awaiting hearings on what’s expected of them when attending their court proceedings. All of which can make a big difference to the prisoners, who gain confidence to attend court, most often by themselves, without legal representation. It also ensures that they have the correct documents with them, which saves time and costs once they are in court. These may seem like simple steps. But they can make a big difference, as Pauline Mbugua’s story shows. Pauline is an unlikely changemaker. She is one of Lang'ata Women's Prison’s remandees in Kenya, where she also serves as one of APP’s auxiliary paralegals, assisting other prisoners with their cases. Her advice and assistance with their documents and plea hearing can make all the difference for her client. This means a speedy well-conducted hearing for the courts and the appropriate sentence or release for those otherwise detained without access to justice. This also helps to reduce an otherwise over-crowded prison system. And it reminds us that when a changemaker - such as Pauline - is given the skills and opportunity, she knows how to turn prison into a place of transformation, not only for herself but for the many whose lives she will change. Newer PostAccess to Justice in A "Peculiar Environment"